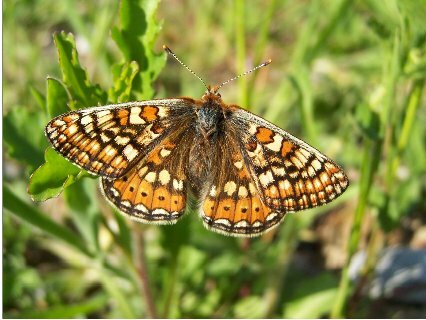 Special features: The Marsh fritillary population has declined in the U.K. due to loss of habitat. They are slow flyers and breed in the same areas each year. As their meadow homes were drained, or ploughed up, many colonies disappeared. The caterpillars are black with short black spiny hairs. They feed inside a protective web. Food: Nectar. The caterpillars feed on Devil's bit scabious and plantain.